Ta dah! It’s finished at last. Last year on holiday I started making a skirt, I had spent ages and ages trying to figure out the pattern for the main body of the skirt. 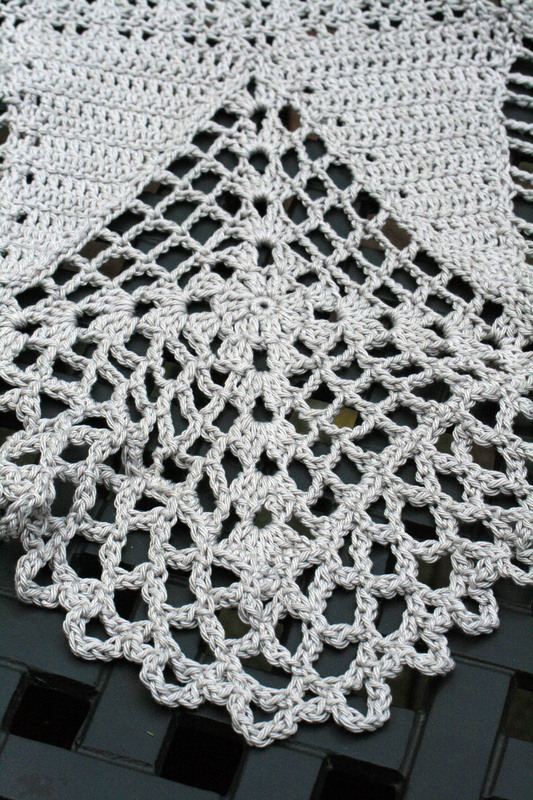 I wanted to copy something I had seen as it had quite a close weave so you cannot see through it which is always a bit of a problem with crochet skirts and dresses. Anyway we met a lovely family one night and the Mum, Cath, was a fellow crocheter and kindly said she would help me work out the pattern, so we agreed to meet up the following day for coffee. We made quite a spectacle, there were three of us sat in the sunshine busy with crochet hooks and coffee, Cath on the right was joined by the cafe owners mother who also was a keen crafter and eager to see if she could help. Cath was the star of the day as she worked out the pattern and helped me write it down, thank you so much Cath. I have to admit that prior to this meeting I had given up trying to figure it out and had started to make my skirt using a simple cluster stitch. 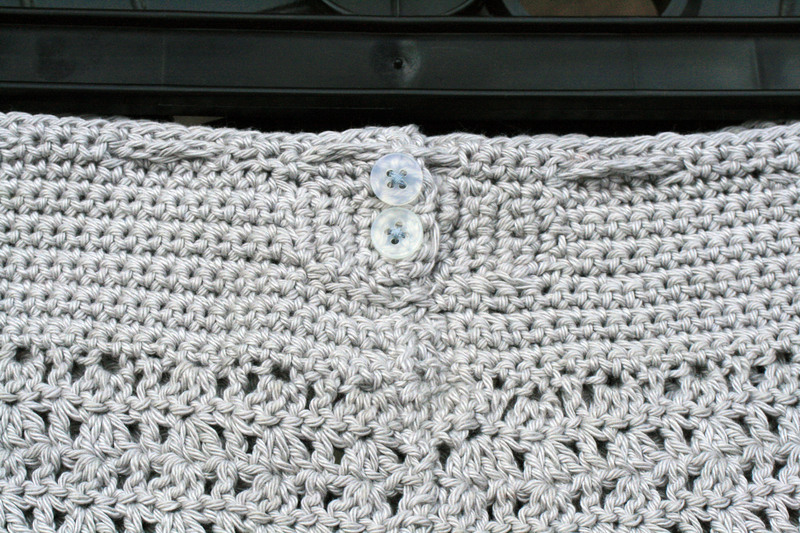 I started with double crochet for the waistband finished off with a self coloured tie belt. I have used cotton yarn which as you all know has little or no stretch so there are a couple of buttons on the back to make it is easy to get on and off. I wanted the skirt bottom to have a flouncy effect so once I had the main body of the skirt about knee length I made triangular shapes all the way round the bottom, 12 in all. Then made squares to fit in between the triangles, I used three different squares. The net pattern again with a flower in the centre. And lastly this one which has a bit more detailing in it. 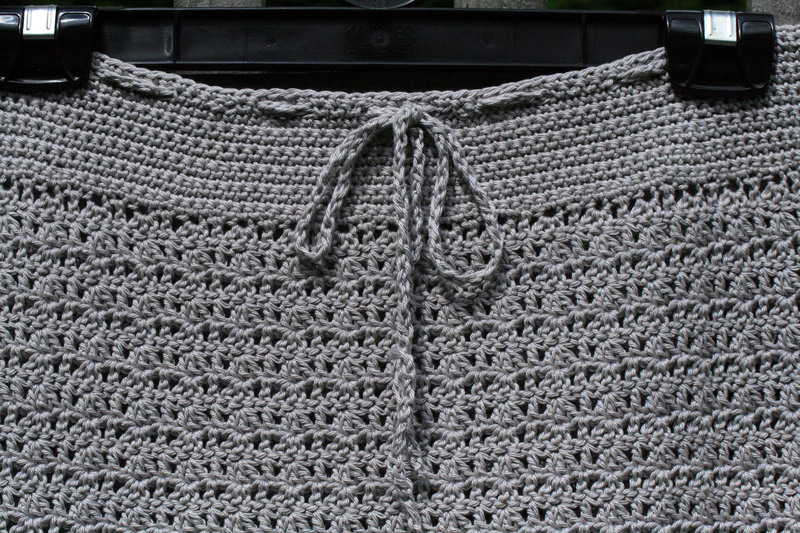 The squares have the effect of making the bottom of the skirt flare out giving it a lovely flouncy bounce. Lastly I finished it off with a border, number 16 from a book I have mentioned to you previously called Around the Corner Crochet Borders by Edie Eckman. This has been one of those projects that has been fraught with ups and downs and I am ashamed to say has taken me ages to feel like picking it up again. But I am so glad that I did. Hey thankyou, It’s a while since I made this skirt and don’t get much chance to wear it given the British climate but thanks for your lovely comment. This is a beautiful skirt! Can I ask what size yarn you used and how much yarn this skirt took? I am so sorry but I cannot recall how much yarn I used, I actually made it while I was on holiday so was in a lovely relaxed state at the time. I have regretted not writing the pattern down as I would like to make it again someday. The yarn was Wendy Supreme Luxury Cotton dk. I hope this helps. Absolutely beautiful. Do you have a pattern for the net square with the flower in the center? Thank you, I am afraid I just made it up as I went along but I am happy to look at the skirt and work it out for you. Can you tell me if it is the large flower or the small one that you would like a pattern for? Thank you. 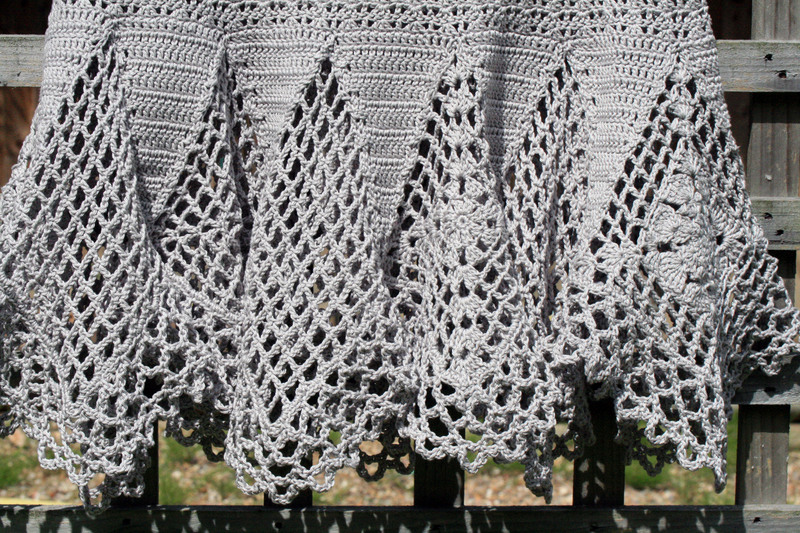 It was rather a freeform type of project so i don’t have a pattern at all but I am wishing now I had done one as I am not sure if I could reproduce it quite the same again. What a beautiful skirt. I love the pattern. You did a wonderful work. Thank you, I am still waiting for the right time to wear it, can’t wait. A beautiful work of art. I love the handkerchief finish. Way out of my league, I can only admire. Lovely to also see the team work it involved. Thank you, I am certainly very grateful for all the assistance from the lovely Cath. Wow, this is a beautiful design! Thank you, it was a bit of a trial at times but I am so glad that I persevered with it and got it finished. WOW! I think I have my next project in mind now! Great, so pleased you are inspired. You are so right, I think of Cath often and look forward to meeting up with her again one day, hopefully wearing my skirt! I have put the writing of the pattern on my to do list but have to admit I am little daunted at the project as I do not find it easy to do. Please be patient with me. I love the skirt. I would have loved to seen it in color. I have made 1 skirt for myself and 1 dress. But your skirt inspires me to do it again. Thank you. Interesting, what colour would you choose or do you mean multi coloured? I would love to see yours, where can I find a photo? It’s lovely! I’m glad you finished it! Thanks, I am so happy I persevered, there were a few times when I felt like giving up. I love your work, I have never tried dying before, the colours you use are fab. This is amazingly gorgeous! If you ever make the pattern available for purchase I will be the first one in line. Wow, thank you. I have thought about making another one and trying to write out the pattern but it just takes so long, it does not come easy to me. How beautiful. You have accomplished a master piece. Are you going to write up the pattern for sale? I am sure there are many people who would love to attempt it too. And thank you for checking out my podcast. I feel honoured. I will give some thought to writing the pattern but I have to say I don’t find that part easy and worry that people would be disappointed if it does not work out for them. Thank you, just waiting for a nice occasion to wear it. I love it! So is it tight enough that you can wear it without a slip? Are you concerned that it will shrink after washing, since it is 100% cotton? Yes, the pattern id tight enough to wear without a slip but I will have to let you know about the shrinkage, I had not thought about that, ooophs! Good job I have 2 skinny daughters, they will have to claim it if it shrinks. Thank you, if it’s any consolation I have never made a hat. It did take a bit of patience and perseverance but I am pleased I stuck with it. This is such a beautiful skirt! I’ve always wanted to learn how to crochet, might have to try it out one day! Go for it, it’s always good to try new things. Awesome! If only I had the skill and patience to make that fab skirt! Well done! Thanks, maybe you should give it a go. WOW, this is stunning creation! 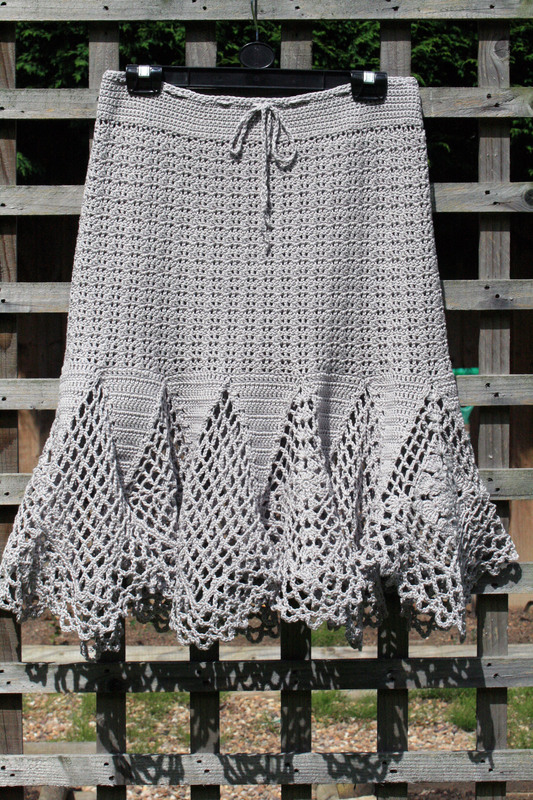 Love the shape of the skirt an the stitch pattern. Well done. Thank you so much for showing your appreciation. My pleasure, I enjoyed visiting, see you again soon. Thank you so much for adding me, I will be visiting you regularly too now I have found you. Very cute skirt. It looks like it was worth the effort! I think so now but there were times when I wondered! Incredible! Do you sell your patterns? If not, perhaps something to consider – I know I’d love to have this pattern. Wow thank you for the encouragement, I would have to make it again if I was going to try and write a pattern for it. I am afraid that much of what I make I achieve through trial and error rather than good planning. I would like to write patterns in the future. A truely wonderful make. Have you worn it yet? How does it wear? Would love to see a picture of it being modelled. It the same yarn I used for my recent cushion, maybe a slightly lighter shade. I will get someone to take a photo when I wear it and post it on the blog, I want to show it with the crochet top my friend Agathi made for me last year. I thought it looked like the same yarn as your cushion, which I love by the way. That is amazing! 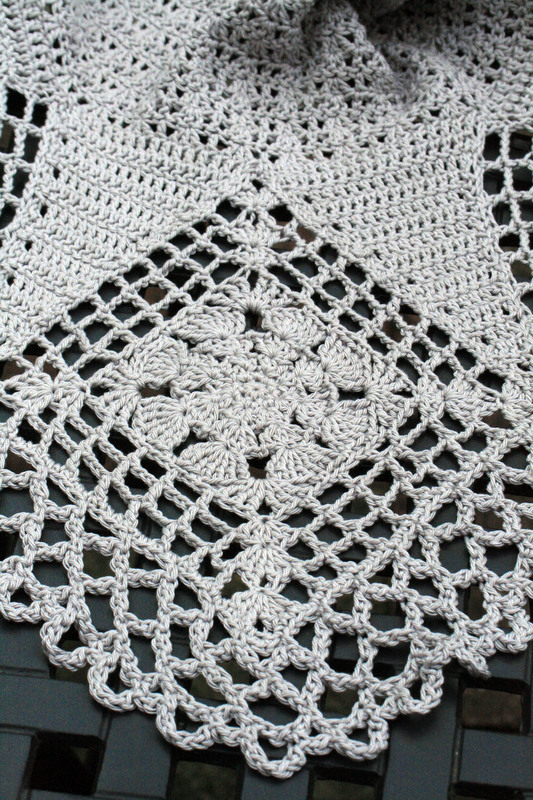 I hope I can crochet something that complex one day. Beautiful. I am sure you will, to be honest I think I have surprised myself with this as I wasn’t sure that I could pull it off. The cotton I used had very little give so I made sure that the starting chain was quite generous as I knew I would be able to pull the waist in with a drawstring style belt, also adding the buttons at the back worked well. I will give it a bit more thought and come back to you if I can think of anything else. Thanks, I hope you do, I would love to share ideas. I’m sure you’re so glad that you’ve finished it. Well done. 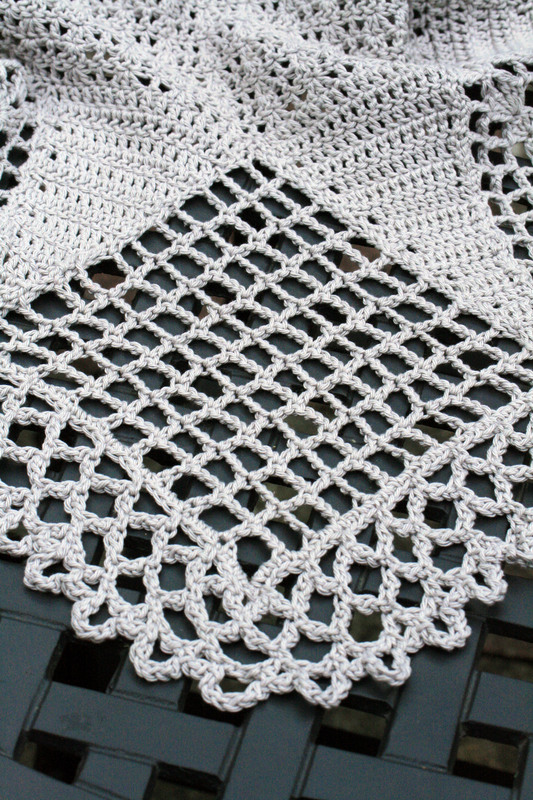 So glad, with all those squares added the outer edge at the bottom was veeeeery long to crochet the edging around! Thanks Mama H, looking forward to seeing a closer view of your shrug.